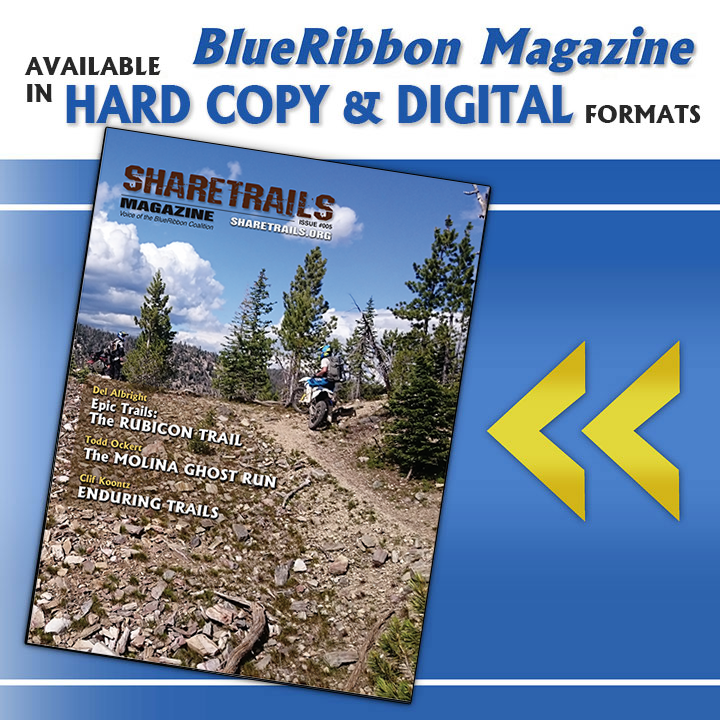 POCATELLO, ID (August 12, 2016) -- Sharetrails.org/BlueRibbon Coalition (BRC) is pleased to announce the recent release of issue #5 of the newly renamed Sharetrails Magazine (formerly the BlueRibbon Magazine). This issue is packed with outstanding articles and a variety of recreation topics. Hard copies of Sharetrails Magazine should be arriving at doorsteps this week (if they have not already arrived). If your copy has not yet arrived, there's no need to wait! The digital edition of Sharetrails Magazine is available today, in FlipZine or PDF versions. For this issue, the FlipZine edition is hosted by yumpu.com (please note that the FlipZine may take a little time to load, depending on internet speed; you may also get better results on portable devices with the yumpu app). Please take note of the fine advertisers in the magazine, and give them the support they have given BRC! The BlueRibbon Coalition (BRC) is a national non-profit organization that champions responsible recreation and encourages a strong conservation ethic and individual stewardship, while providing leadership in efforts to keep outdoor recreation alive and well -- all sports; all trails. With members in all 50 states, BRC is focused on building enthusiast involvement with organizational efforts through membership, outreach, education and collaboration among recreationists. 208-237-1008 - http://sharetrails.org. Donate Now to Support BRC’s Advocacy Efforts!